When you’re counting carbs, it’s easy to get tripped up by packaged foods -- like y yogurt -- that sneak in lots of added sugar. Your best bet when monitoring your carbohydrate intake is to choose a plain, unflavored yogurt. Read the nutrition labels on different brands to determine the grams of carbs and sugar in each container -- as well as protein, which you want to boost in a low-carb diet. Sugar is a type of carbohydrate, and all dairy foods and milk products, including yogurt, contain a natural sugar called lactose. The amount varies according to brands and types of yogurt. You’ll find the lowest carb and sugar counts by far in plain, unsweetened varieties of yogurt. A cup of low-fat, plain yogurt has 17 grams of carbs, all from natural sugars; the same serving of low-fat plain Greek yogurt has 10 grams of carbs, of which 9 grams are sugar. If you choose whole milk yogurt, a 1-cup serving contains 11 grams of carbs, while a cup of plain, whole-milk Greek yogurt has 10 grams of carbs. In both of these whole milk yogurts, all of the carbs come from sugar. Although you may think low-fat yogurt is better for a weight-loss diet, some research suggests otherwise. A study that followed more than 1,500 middle-aged men for 12 years found that those who ate full-fat dairy instead of lower-fat versions had less abdominal obesity -- one of the risk factors for heart disease. The results were published in the Scandinavian Journal of Primary Health Care in 2013. Flavored yogurts are much higher in carbs and sugar. A cup of strawberry-flavored Greek yogurt has 29 grams of carbs. If you subtract the fiber content of 2 grams, you’ll arrive at what low-carb diets call “net” carbs; it’s still high at 27 grams, which is also the amount of sugar in that serving. Vanilla-flavored yogurt, which you would expect to have less sugar, may actually have more. A cup of vanilla low-fat yogurt supplies 34 grams of carbs, all of them from sugar. Even honey-flavored yogurt is higher up the carb and sugar chain, with 1 cup of a popular brand containing 34 grams of carbs -- again, all from sugar. Choosing yogurt with artificial sweeteners does drop the sugar count, but the overall carbs remain high. A fruit variety of low-fat yogurt, artificially sweetened, has 46 grams of carbs, with 7 grams from sugar. Flavored frozen yogurt is high in carbs and sugar too. A cup of vanilla soft-serve will set you back 35 grams of carbs, all from sugar, without counting any add-ons like fruit or sprinkles. And that assumes you stop at a cup -- at self-serve stores, you may actually be helping yourself to 12 ounces of yogurt, registered dietitian Monica Reinagel found in an informal investigation. If you choose an artificially sweetened fro-yo, it will still run high in carbs. A cup of chocolate, for example, has 33 grams of net carbs, 23 of which are from sugar. Plain yogurt is definitely the best way to go. You can dress up your plain yogurt with 2 tablespoons of slivered almonds, which adds just 1 gram of net carbs, or a half-cup of fresh red raspberries for 3 grams. If you find you can’t live without flavored yogurt, reduce your portion size to cut your carb and sugar intakes. Many popular brands of regular and Greek yogurt now come in 5.3- and 6-ounce sizes. One well-known brand features a line of yogurts with 100 calories. The strawberry banana flavor has 10 net carbs, 7 of which are from sugar, in a 5.3-ounce serving. 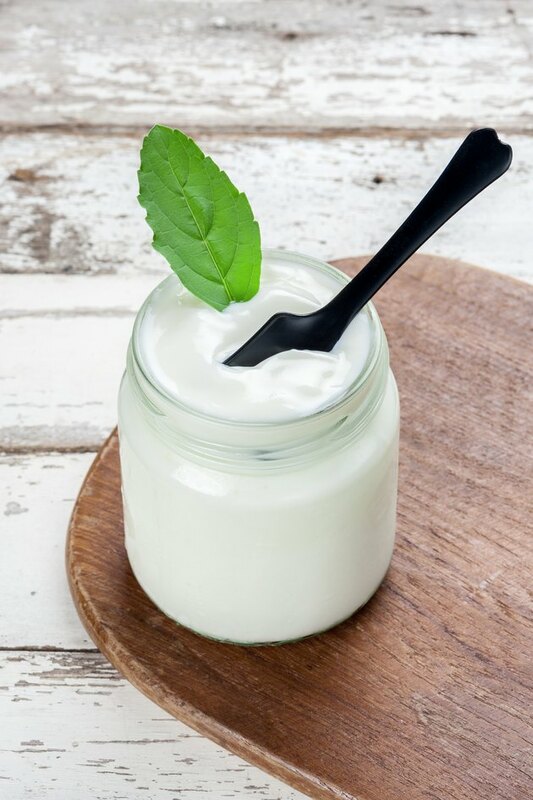 If you hit a weight-loss plateau on your low-carb diet, dairy -- including yogurt -- may be a culprit, suggests Andreas Eenfeldt, M.D., on his website DietDoctor.com. Try cutting back on your consumption to see if you reboot your weight loss. Nutrition Diva: Frozen Yogurt: Health Food or Dessert?